Bechtel sought a new web platform to reinforce their corporate communications efforts to emphasize the human side of what they do and their significant efforts towards sustainability, stewardship and community service. We faced this challenge with unrelenting internal pressure from a company that at its core is engineering focused with an obsession over magnificent structures. The new site also had to be launched on an extremely short time line. The solution was to develop a tool to create a visual story around each mega project that balanced the presentation of exciting engineering feats with the people who built them and the project's community benefits. With our strategy of building a library of flexible visual components, Bechtel used their new content management tools to integrate photography, videos, statistics and quotes into compelling narratives. 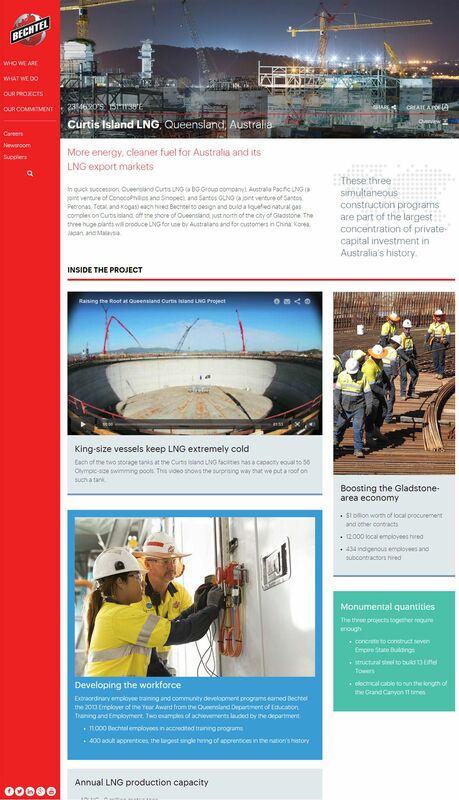 Leveraging this new engaging content to reinforce the positive change, Bechtel achieved a site that supports the alignment of public perception with their efforts.